Imperial architects scales are available in a variety of graduations which allow for the reading of architectural drawings based upon a designated foot per inch scale. Thus if a particular scale is a ᶾ/₃₂”” scale on an architectural plan, the drawing designates one foot in the real world per ᶾ/₃₂” on the drawing. Generally floor plans are drawn on a ¼” scale or for larger plans a ⅛” scale. Small plans or single room drawings may be scaled larger, utilizing ⅜”, ⅟₂”, ᶟ/₄”, or 1”per 1’, whatever is needed to fit your drawing format. 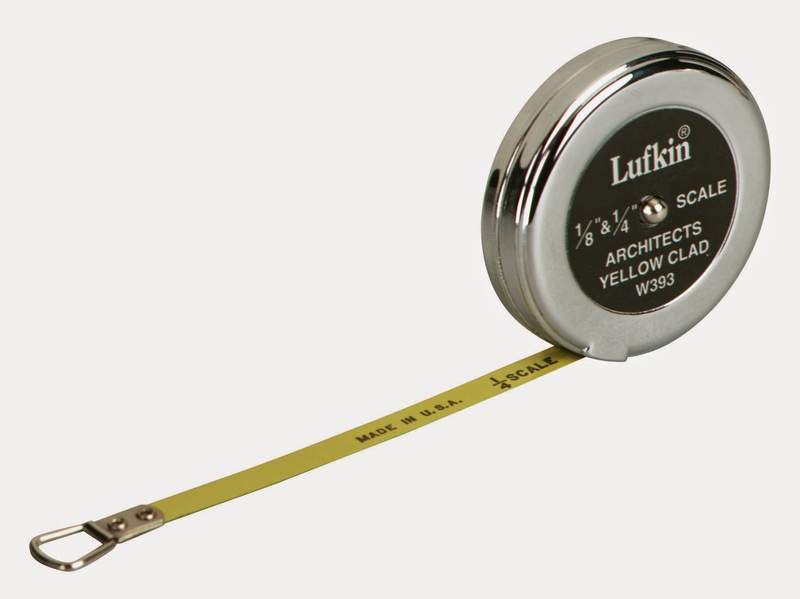 This particular scale is produced by Lufkin and gives a ⅛” & ¼” to 1’ scale. It features a ¼” yellow clad steel tape blade with jet black tape markings that vividly contrast for high visibility, and has an automatic operation spring return. The metal body construction creates a durable product ready for long years of service.